Rosemary herb, rosemary plant, health benefits of rosemary, how to make rosemary tonic and other uses of this gorgeous herb. Rosemary is one of those wonder herbs that has so many uses! And it is so easy to have in your garden - it is just there. It doesn't need too much attention, and seems to survive extreme heat and cold! So, if you don't already have a rosemary plant in your garden, treat yourself and getting planting! Rosemary has been used since ancient times for relieving depression and stress. The rosemary plant is a frost-hardy perennial herb. It grows well in full sun and well-drained soil. Plant as a companion for carrots. Its aroma repels pests and attracts bees. This makes it a great room freshener and natural insect repellent. Make your own rosemary tincture to relieve stress and mild depression. Finely chop the fresh rosemary and put into the glass container. Pour in vodka or apple cider vinegar to cover the rosemary herb. Close the container tightly. Label with the date. Store in a warm place for about 2 weeks. Shake it well every day. After 2 weeks, strain the mixture through a muslin cloth. Pour your tincture into a dark glass bottle, label and store in a cupboard. Take 2 ml (half a teaspoon) twice a day, in water. Hang bunches of fresh rosemary in your home. The aroma is uplifting and the rosemary plant is an attractive and relaxing shade of green. Rub fresh leaves over counter tops, tables, and windowsills. Add a few drops of rosemary essential oil to a cup of vinegar. Then add a few squirts of dishwashing liquid and use this to wash your floors and surfaces. Pick a bunch of fresh rosemary from your garden. Strip the leaves and place in a blender. Add 2 cups water, 2 tablespoons coarse sea salt and 2 tablespoons of your choice of oil. Blend together. Add more water if necessary. Strain and place in glass container. Add the strained mixture to your bath to ease tired and aching muscles. Rosemary is a natural anti-inflammatory. Gargle with rosemary infusion to relieve a sore throat. It stimulates blood circulation. Take 50 ml of rosemary tonic every 3 hours to relieve headaches. Rosemary stimulates the adrenal glands. Use as a tonic to recover from chronic illnesses. Place sprigs of rosemary among books to keep moths away. 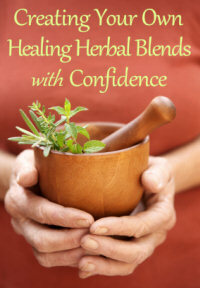 Learn how to create herbal blends for healing for your own personal healing and your family. Add herbal healing to your existing healing practice. Start your own herbal healing business and selling your own herbal blends. Grow your own herbs and harvest them for use. Understand herbology before you decide which healing avenue to pursue. Tap into a holistic and natural resource for healing.